Inspired by the Supernatural for the #31DC2016Weekly - Polish Etc. I know I am a little late on this week's prompt, but at least I have it for you now! Being out of town on the weekends really messes with my blogging schedule. For this prompt, I went with a classic supernatural being, the mermaid. Everyone loves mermaids. Mermaid nails, mermaid hair, mermaid fin blankets and pool gear...we see them all. Who doesn't love The Little Mermaid? Nobody because it's an awesome Disney classic. 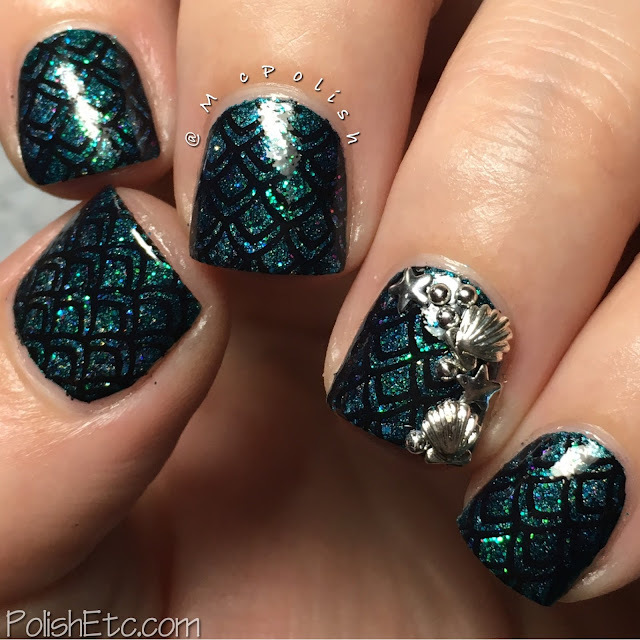 For my mermaid inspired nails, I decided to go with a teal mermaid tail design. I started with a base of A England "St. George" which is a one coater intensely holographic teal polish. It is one of my top 5 polishes of all time! Then I sparsely sponged on a few blobs of Different Dimension "Blue Raspberry Airheads" which is a aqua blue linear holo and a few blobs of Digital Nails "Serenity" which is a super shifty microglitter in teal/purple/gold. 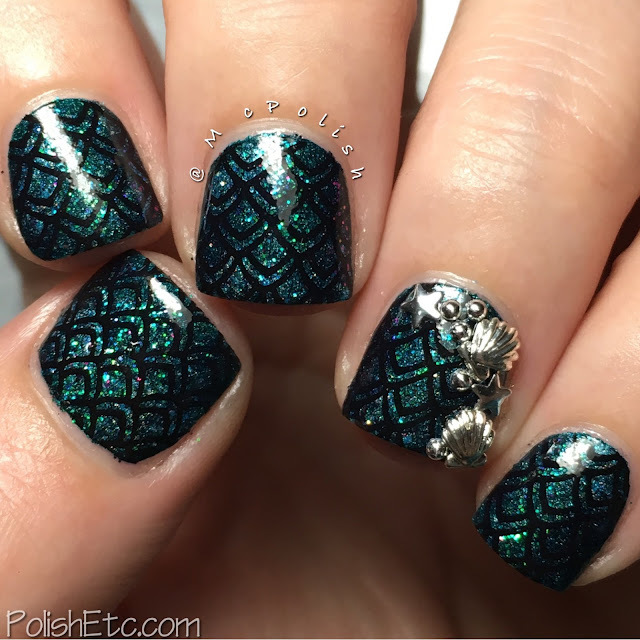 Lastly, I stamped over the top of this sparkly mermaid base with Messy Mansion MM21 plate using Konad Black stamping polish. The extra silver baubles on my accent nail are a mix of studs from various places. I really liked how this mani turned out and I totally felt my inner Ariel come out. Only two more challenges left! Stay tuned and check out the #31DC2016Weekly tag on Instagram, Twitter and Facebook. That's so beautiful! :) I love it!